We offer same day delivery on most products within a 5 mile radius of our store. We will deliver within 3 hours of you placing your order. On some occasions, the item(s) ordered may be held at our warehouse and therefore we may be unable to delivery it in the 3 hour period. If this is the case, we will get in contact with you. Add all the items you would like to purchase to your shopping cart. Once you are finished shopping, go to the shopping cart. Above the checkout button, select the 'same day delivery' button. 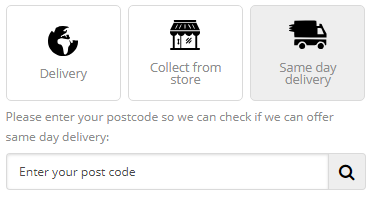 Enter your postcode and click the search button to confirm that we can offer same day delivery to your location. Select the required date for the delivery. Usually this will be today's date, but you can also book in advance. Click the 'checkout' button and follow the process through to complete the order. You will receive email confirmation that we are processing your order. We will send you another email as soon as your order has been dispatched with a live tracking link.